"This is an idea that both President Obama and someone with a third-grade education can get excited about," he said. The model he hopes to spread throughout southern Minnesota will eventually include turkeys, pastured and forest-ranged pigs, small grains, perennial fruits, vegetables and herbs. Illustrating why the plan will work with a story about the 1,000-year-old symbiotic relationship between hazelnuts and chickens, Haslett-Marroquin insists he’s no romantic idealist. "We’re not dreaming here," he said. "This makes long-range economic sense." 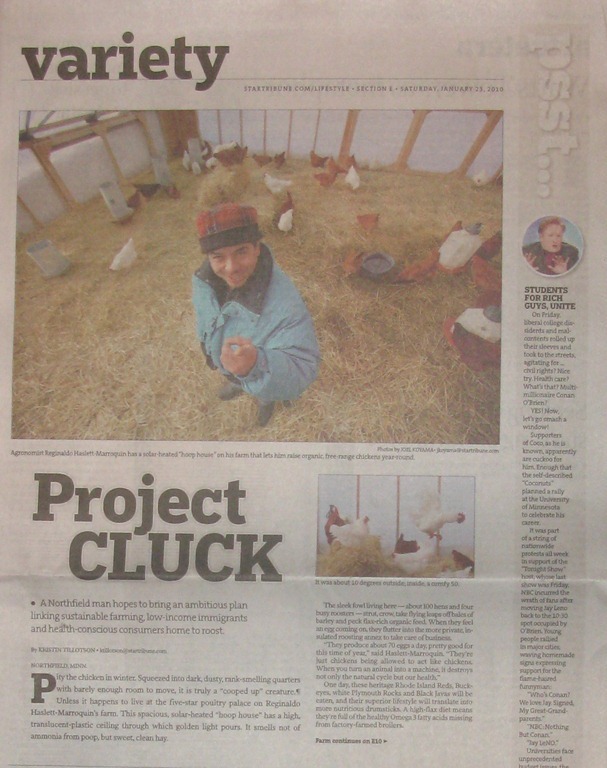 Regi has a blog post up titled Star Tribune Article on our Work. For more, the REC page on the Agripreneur Training Model and the Hillside Farmers Cooperative Facebook fan page.